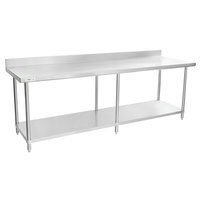 Stainless steel work tables with undershelves are essential products to have in your commercial restaurant, bakery, cafeteria, or catering business. 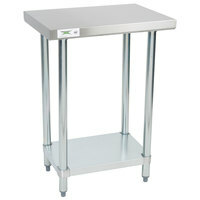 These items feature flat surfaces, so chefs can tenderize meats, chop vegetables, knead dough, or mix batters. 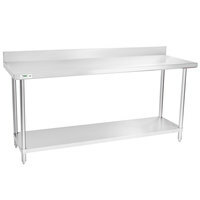 Plus, they have shelves located underneath of their work surfaces that are perfect for storing dishes, small appliances, bulk ingredients, and other supplies. 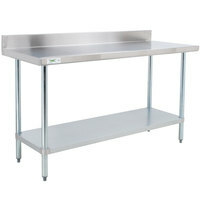 We carry stainless steel work tables with undershelves in different sizes, so you can find something that’s perfect for any compact or spacious kitchen. 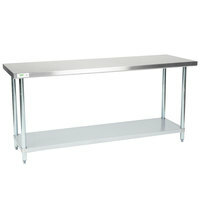 You can also find models with great features like backsplashes and marine edges, both of which keep liquid and other items from falling off of the table. 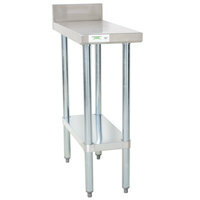 We even have units with adjustable feet, so you can make your prep surface higher or lower to meet your needs. 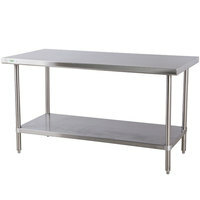 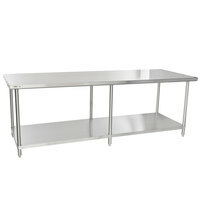 Good - This Regency work table is great for prepping entrees, sides, or desserts at your busy commercial kitchen. 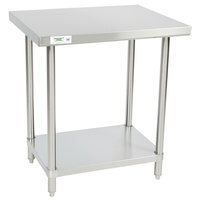 It includes a galvanized undershelf to store flour, sugar, extra food pans, and more within easy reach. 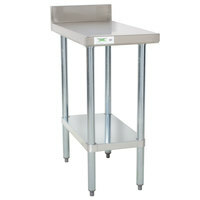 Plus, galvanized steel legs support the tabletop and provide excellent corrosion resistance. 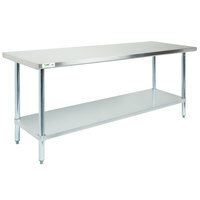 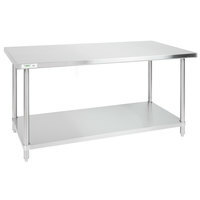 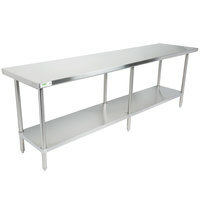 Better - This Regency work table not only provides plenty of room on its work surface, but also offers a 304-series stainless steel undershelf to supply much needed space for food preparation, storing supplies, and other tasks within your business. 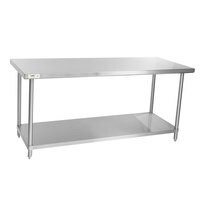 The stainless steel construction is more durable than galvanized steel, making this table a good choice for fast paced, high-volume operations. 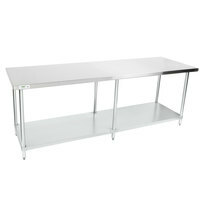 Best - With the strength and reliability you've come to expect from Regency series work tables, this spec line table is the most durable and heavy-duty option available. 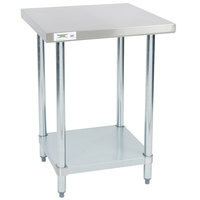 Ideal for butcher shops, this table features a strong fabrication that won’t dent or warp, even after repeated hits from a meat tenderizer or heavy knife. 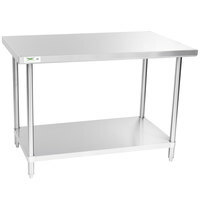 Plus, the stainless steel undershelf provides a convenient place to store scales, cutting boards, food storage boxes, and other small appliances within easy reach. 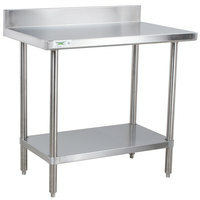 Good - This Regency work table with backsplash is great for prepping entrees, sides, or desserts at your busy commercial kitchen. 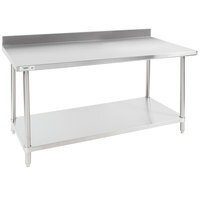 It includes a galvanized undershelf to store flour, sugar, extra food pans, and more within easy reach. 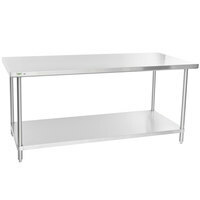 Plus, the backsplash protects your posterior walls. 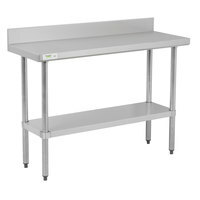 Best - With the strength and reliability you've come to expect from Regency series work tables, this spec line table with backsplash is the most durable and heavy-duty option available. 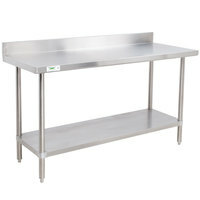 Ideal for butcher shops, this table features a strong fabrication that won’t dent or warp, even after repeated hits from a meat tenderizer or heavy knife. 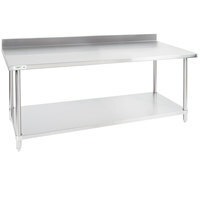 Plus, the stainless steel undershelf provides a convenient place to store scales, cutting boards, food storage boxes, and other small appliances within easy reach. 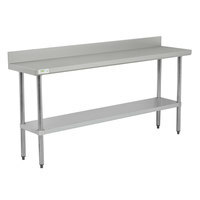 With the strength and reliability you've come to expect from Regency series work tables, this spec line table is the most durable and heavy-duty option available. 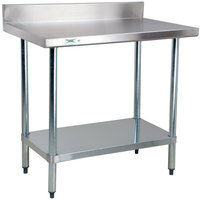 Ideal for butcher shops, this 14-gauge stainless steel table features a strong fabrication that won’t dent or warp, even after repeated hits from a meat tenderizer or heavy knife. 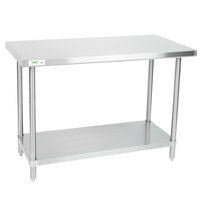 Plus, the stainless steel undershelf provides a convenient place to store scales, cutting boards, food storage boxes, and other small appliances within easy reach. 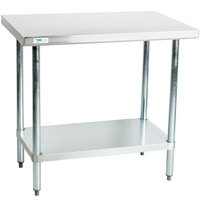 This Regency 16-gauge work table not only provides plenty of room on its work surface, but it also offers a convenient undershelf for storing scales, cutting boards, food storage boxes, and other small appliances within easy reach. 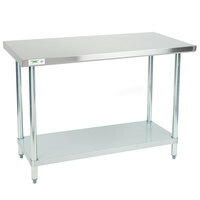 Its corrosion-resistant stainless steel construction provides easy maintenance and is more durable than galvanized steel, making this table a great choice for fast-paced, high-volume operations.